This is Dipper Powers with the first-ever Happy Sock (still in use after several years!) A Happy Sock is an unwanted sock that's been stuffed with catnip and polyfill. It makes a great, big, fluffy toy that can be hugged, kicked, and (as you can see) even licked. Catnip produces a harmless, non-addictive euphoric state that lasts for around 20 minutes. 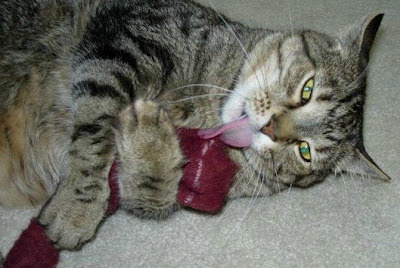 Most cats are very playful and goofy when they experience catnip; then later, they may just doze off. Dipper likes his Happy Sock because it's durable and large -- much more fun than those silly little catnip toys sold in stores. Best of all, Happy Socks are very fun and affordable to make, which means that you can make them for cats in homeless shelters and help them feel better, too. Really great news!!! this information is well worth looking everyone. Buy Pet bowl and other accessories related Pets at Home, The Loving Bowl pet shop Give your cat a stylish pot to eat. That sock is a favorite.